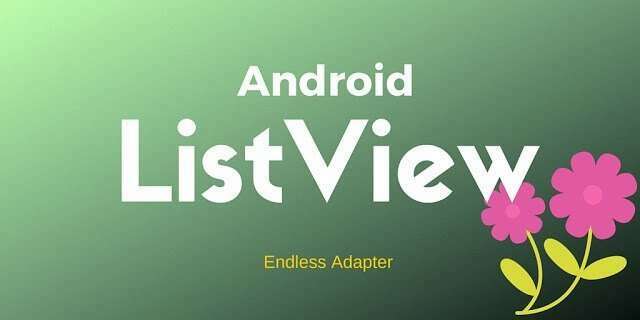 This post describes how to use an Android Listview endless adapter. There are some situations where an Android app with a ListView have to load new data as the user scrolls down. This is the case of an endless adapter. An endless adapter, in other words, is an adapter that loads more data when a user reaches the ListView end. This kind of adapter is useful when there is a large number of items and we don’t want to show them all to avoid a long loading time. This post explains how to implement it. In this case, the custom adapter is very simple and we can replace it with something more complex or use the standard android adapter. To implement an Android Listview endless adatper it is necessary to code a component that holds the business logic. In this component, we have to find a way to check if the user scrolled all the item inside the ListView and he/she reached its end. Let us begin. The first step is creating a custom component so we can extend the standard ListView behavior. At line 12, we simply add the footer to inform the user we are loading more data, then at line 13, we set a true a boolean attribute to not fire the event again while we are still loading the data and then we call the listener. At line 4, we call notifyDataSetChanged to inform the adapter that the dataset is changed. At line 4, we add the new loaded data. At the end of this post, you learned how to use a custom adapter to build an endless ListView. I think this is EndLess ListView Rather than Endless adapter.